It’s like being a kid, and waiting on the step the week of your birthday for the mailman to come in hopes that you have birthday cards in the mail–I absolutely love getting real (read: non-bills) mail! 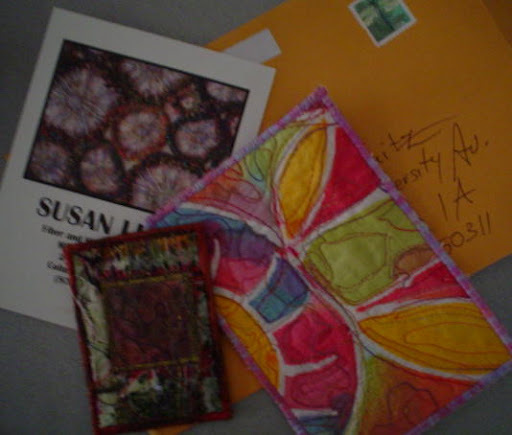 This week I received an artist trading card, and postcard from my friend, Susan, in South Carolina. Isn’t it great?! Susan started an online international art project called Cyber Fyber. She has lobbied arts organization in her home city to provide funding and space for a REAL international art exhibit in January 2009, at Gallery 80808/Vista Studios–and I am currently the only representative from Iowa! She has almost every state in the Union now represented, and numerous other countries. Susan is in her own right, a fabulous fiber artist. She does amazing things with fabric and thread and found objects, she has even had some solo exhibitions! Susan was at one time my boss. She owned (still does) with her husband, Steve, Mouse House–a gallery and frame shop where I once worked embellishing mats for framing, and hand coloring vintage prints/engravings. I continued to do the hand-coloring for them after I moved to Vermont, and then Chicago. At the time we worked together, neither of us had any time to do creative stuff like we do now. I was a fulltime graduate student with two jobs, she was running a VERY successful business and raising two precocious little boys. We shared a love of art, and a desire to find a creative outlet. That was eleven years ago. I’m so very proud of what Susan has accomplished, and happy to be a part of her Cyber Fyber dream! Hi!Thank you ever so much for this wonderful post! I’m blushing….can’t you see the words here turning pink and red? If you ever want to continue coloring….say the word and you’ll get more than an envelope in your mailbox!SusanPS Steve and I fly off tomorrow to see one of those precocious boys in BRB’s Giselle. The other one….well…he’s working two jobs. We know this because he had to call home for his SSN. He managed to flunk out of the 11th grade. Supposedly, he’s going to adult education in the fall but there’s nothing forcing him to do anything. Everyone who knows him and us says that he’ll eventually grow up…he’s just taking the “long” way!